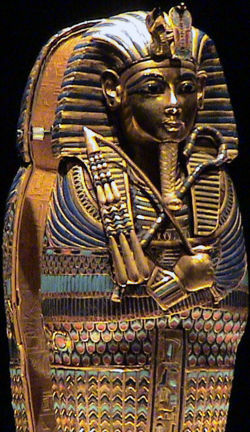 This weekend I was in Philly to see the Tutankhamen exhibit at the Franklin Institute Science Museum. My mom saw this exhibit when it toured the USA back in the 1970s and she still raves about it today, so we met-up and saw the exhibit together. I had read a good amount about the exhibit for a paper I wrote a while back and found out that this time around the exhibit was being promoted more as a rock concert than a cultural event. This was very much the case. The exhibit is surrounded by a lot of fanfare, and lots of publicity. It is being hosted by a partnership between the L.A. based Anschultz Entertainment Group (AEG) (better known for promoting rock concerts), Egypt’s Secretary General of the Supreme Council of Antiquities, and National Geographic. While it might be another 30 years before we are able to see world treasure such as Tutankhamen, this exhibit wasn’t all that it’s cracked up to be. My mom says that the first time around there were a lot more objects, and that while the museum was crowded, one could still enjoy the exhibit and see things in a leisurely manner. This time some of the more famous pieces were missing, including Tutankhamen himself along with his many sarcophagus, and seeing the pieces was challenging in the overly crowded rooms. I also saw a guy in a wheel chair who probably spend the entire time looking at people’s backs since he wasn’t able to get up close to the cases because there were so many people there. These short-comings might give credence to some of the criticism that has surrounded the exhibit, among them the challenge that AEG has outsourced museum curatorial jobs to others outside the field. The Egyptian Secretary General of the Supreme Council of Antiquities Dr. Zahi Hawass explains that Egypt has a wealth of treasures that need to be preserved, not all as flashy as Tutankhamen, so the motivation behind the exhibit is to raise much needed funds to help with this preservation initiative. In interviews, several Egyptologist said that most of what Dr. Hawass was doing for their field was long overdue, things as simple as installing air conditioning at the Egyptian Museum in Cairo. He has instituted zoning around major antiquity sites and built visitor centers to prevent further degradation. He also has plans to build a regional museum in Egypt, including a sprawling new structure besides the pyramids (Waxman, 2005). While this effort is certainly much needed, a tricky situation has been created whereby the hosting museums are needing to charge significantly higher admission prices than usual in an effort to brake even, since the Egyptian government must make 10 million per stop before the museum makes a penny. The Egyptian government claims that all the hosting museums made money during the first tour, while they made none, although this is contested. I guess some balance needs to be found by which poor nations with treasures of importance to the world should be able to access needed funds for preservation and promoting education, but doing so in a way that doesn’t limit the amount of people who can see them because they have been priced out of the market. Treasures like Tutankhamen, in a way, belong to all of humanity and should be accessible to everyone, not just those with deep pockets.